Today sees the start of a brand new challenge over at the Julia Spiri challenge blog and as usual we the DT have been thoroughly spoilt with the images we have been given t0 work with. The theme for the challenge is Use Something Old so basicly anything that you have had in your stash for a while. Here is a card that I have created and I hope that you like it. I took a 6x6 card blank and covered it with blue & white gingham paper then layered it with blue and white dotty paper with a piece of grossgrain ribbon across the centre. The topper came next which is the gorgeous Girl with Hair wrap digi designed by Julia Spiri and coloured with a selection of copic ciao pens, I have also distressed it around the edges with my Tim Holtz distress tool. To finish I have popped on some card candi, sentiment, little wooden hearts that have had glitter glue added a bow and a sentiment. We love to see what you create for our challenges so pop along and join us for your chance to win! 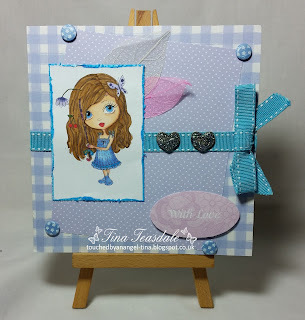 This is gorgeous Tina, love the papers and cute little image. Hi hun, Gorgeous card as always, love the cute image and great colouring.